I couldn't go out for dinner on my birthday as it was a Monday and very few restaurants are open on a Monday down here. So I decided to wait until Friday when my TWDB booked a table at the Clos des Oliviers at St Gély du Fesc. I've known this restaurant for several years and even used to live just around the corner, but it's recently changed hands and is now run by M Didier Latour. I was very optimistic because my good friend Diane has been there recently and raved about it, which is always a good sign. My friends are suitably fussy about where they eat so can be relied upon for credible information when it comes to restaurants. Before I hunt on Trip Advisor or the like, I ask around. As you can see from the photo, it's been decorated in shades of aubergine and wood. This is not my photo but comes from another blog where you'll find many more photos of the dishes served (if you're interested). The welcome as you walk in is warm and friendly as you're greeted by Mme Latour who is a perfect hostess - not ingratiating, but makes you feel your custom is appreciated. This is most gratifying. We were the second set of clients to arrive and were taken to our table for two. The atmosphere was intimate and perfect for a peaceful dinner. As the evening wore on, all the tables in our section filled up, so they are obviously doing well. The local oysters were chopped up into a tartare and served on the asparagus with a jambon hat set at a jaunty angle. The flavours went marvellously together and the oysters were delicious and fresh. We sat and appreciated the depth of the flavours, concentrating on identifying the subtle components of the mixture. The bar (seabass) fillets were rolled around a scallop, a delicious combination, and set elegantly on the slab of slate. I'm not terribly keen on dessert, and I usually go for the lightest one possible. All three on the menu were quite substantial, so I went for the chocolate choice. It was a chocolate coffin in which were placed the pastry, chocolate mousse and an interesting citronella mousse. Fantastically original, but not very light so I couldn't finish it. We washed it all down with a bottle of white Mortiès and the whole bill came to 125€ which was amazing value. 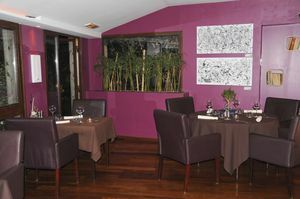 Recommended for: welcome, service, variety of flavours, presentation of dishes, quality of ingredients, and value for money. Sorry, but "essence de chorizo" just cracks me up. I can't imagine chorizo beiing anything other than a hearty right up in your face punch. LOL PG, you're right but it was actually pretty tasty and fit in well with the rest. Great stuff, chorizo!